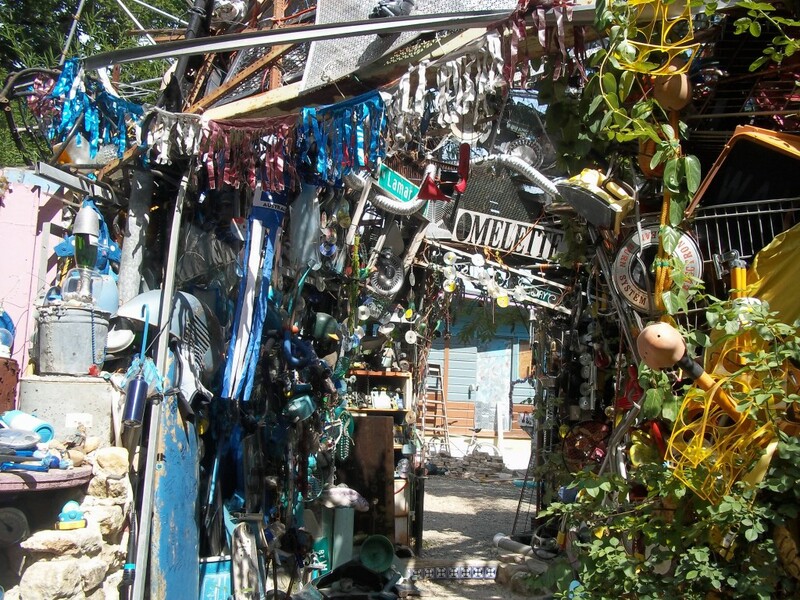 Enter the Cathedral of Junk. This two-story colossal creation reflects decades of collecting, building, dreaming, and creating, all by one man. Found in a random residential neighborhood in Austin proper, it is actually on private property in a backyard. It takes up nearly the whole yard and is just unreal. It would be an understatement to describe the owner as eccentric (they usually are), but he was friendly and talkative and awesome. 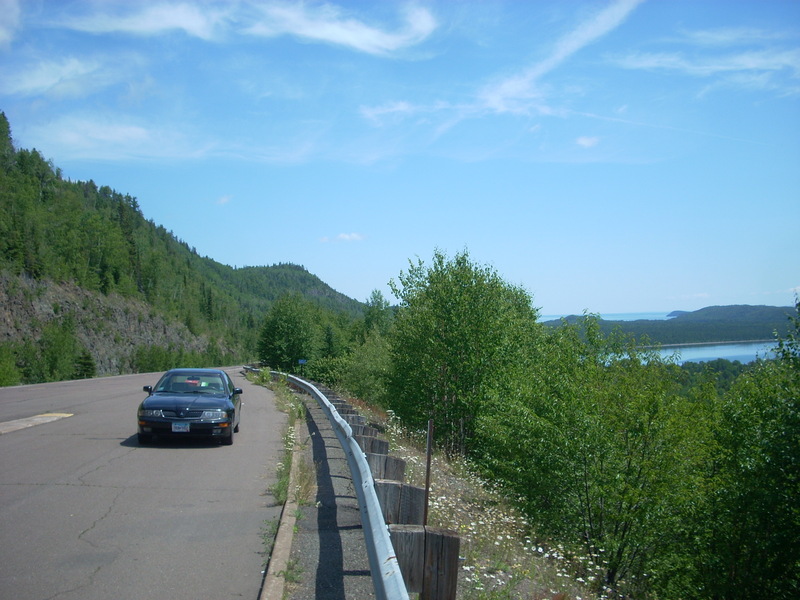 Although visible from the road, you need to make your way along the side of the house and into the backyard. Sign the guestbook and make a donation if you like. This thing will blow you away. You enter into a room with a high, domed ceiling (similar to a cathedral), into a hallway and through corridors and around walls made from everything you can think of. 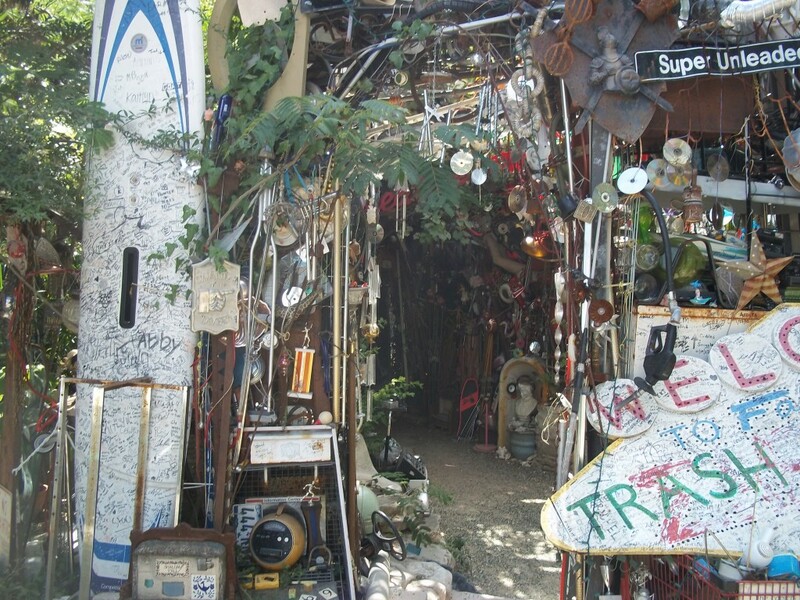 It winds around the side up to a more levels, reminiscent of a treehouse, walls plastered and crammed with trinkets, parts, tools, signs, bikes, and god knows what else. 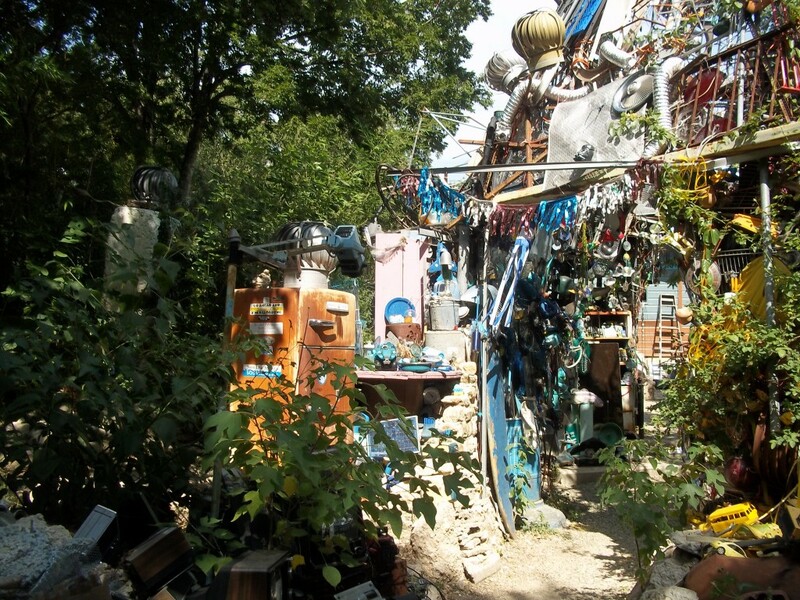 Vince Hannemann has been collecting junk and building since he was a kid, and started this towering structure in 1989. The neighbors and the city aren’t always on his side, either. Apparently city officials have been out to test its sturdiness and some nearby residents have filed complaints. It’s not going anywhere though. 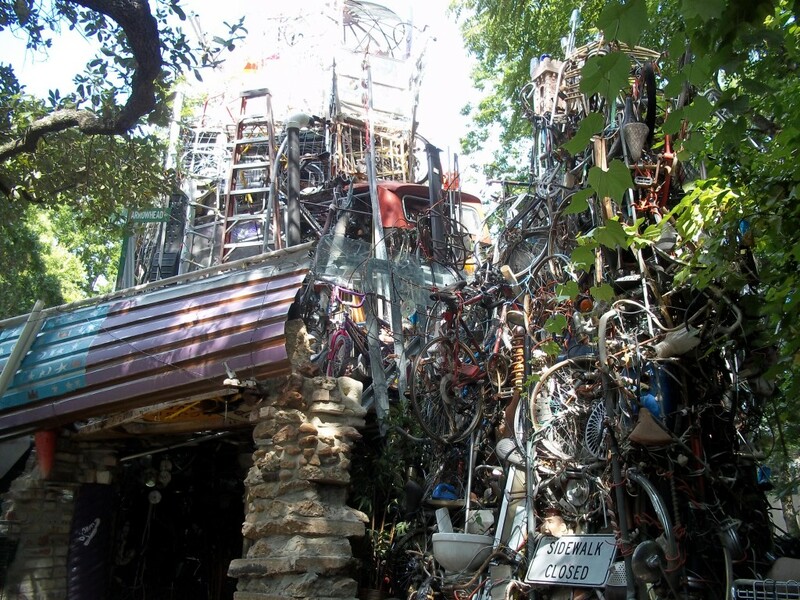 This beloved masterpiece fits right in here in the city whose unofficial motto is “Keep Austin Wierd.” The owner said that people bring stuff by all the time to add to it, some of which he does and does not. It’s truly unexplainable until you actually see it. If you find yourself fortunate enough to visit this gem of a city in the heart of the South, seek this place out and explore it. It’s amazing. While in the area: Austin is the “Live Music Capital of the World,” so just about every neighborhood bar, and there are loads of them, has bands playing. There are two gigantic music festivals each year here, plus college football at its absolute best (the Texas Longhorns). South Congress Ave is the artsy-folksy uptown area with all kinds of eclectic shops and restaurants, and the 6th Street section of downtown is always rocking. 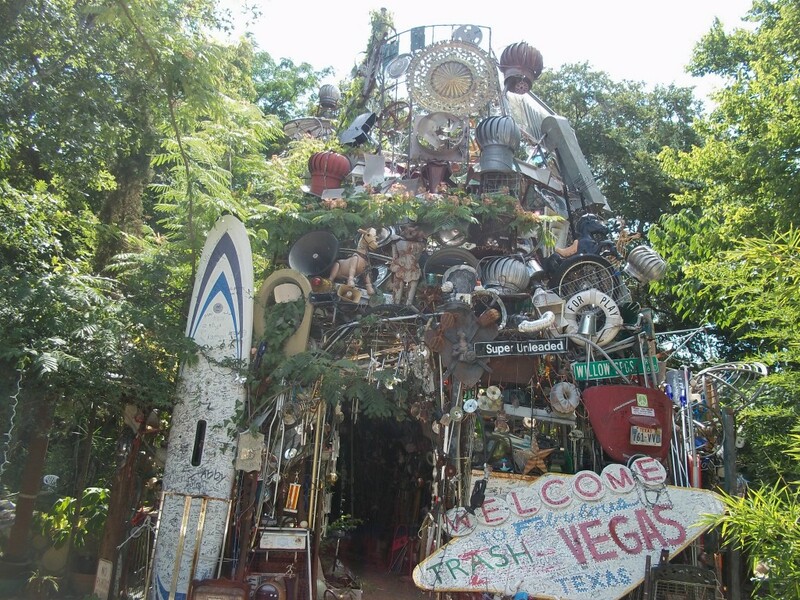 This entry was posted in Highway Highlights and tagged Austin, TX, Yard Art by Seth5544. Bookmark the permalink.